It is Carpetball not Carpet Ball. Knocking a ball off the table results in forfeiting the game. 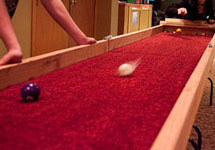 A game starts with 5 balls on each side. Anyone who disagrees with these rules will be forced to wear a scarlet letter C and face the full wrath of the Carpetball Inquisition or something like that.